This chapter is a synthesis of new knowledge, procedures, best practices and references for collecting plant diversity since the publication of the 1995 volume Collecting Plant Diversity: Technical Guidelines, edited by Luigi Guarino, V. Ramanatha Rao and Robert Reid, and published by CAB International on behalf of the International Plant Genetic Resources Institute (IPGRI) (now Bioversity International), the Food and Agriculture Organization of the United Nations (FAO), the World Conservation Union (IUCN) and the United Nations Environment Programme (UNEP). The original text for Chapter 23: Collecting Woody Perennials, by the Forest Resources Division, Forestry Department, FAO (based on the work of L. Thomson), has been made available online courtesy of CABI. The 2011 update of the Technical Guidelines, edited by L. Guarino, V.
Ramanatha Rao and E. Goldberg, has been made available courtesy of Bioversity International. There have been a number of changes during the decades since the establishment of the first commercial tree plantations. Seed propagation was formerly the principal mode of raising plantation stock, but now vegetative propagules in the form of rooted cuttings and tissue cultures are increasingly used. With the rapid decline in natural forests, especially in the tropics, potentially good sources of seed are becoming scarce, and seed collectors must often rely on scattered trees in farmlands or fragmented forest remnants, which are often degraded. These are the challenges of modern seed supply. The overall principles for collecting woody perennials, as written in the 1995 version of this chapter, are still valid, but improved access to technical equipment and information have modified many practices. Technically, seed collection has become easier, thanks primarily to technical developments outside the forest sector. Modern communication to the remotest areas of most countries has also helped, and GPS technology, satellite maps and computer databases have revolutionized the documentation process. In this revision of the 1995 chapter, we review collection methods and problems and look at the challenges ahead. The supply of forest seed has undergone a number of changes during the decades since the first commercial plantations were established. Where seed propagation was formerly the principal mode of raising plantation stock, vegetative propagules in the form of rooted cuttings and tissue cultures are now increasingly used for genetically improved material such as pines, eucalypts, casuarinas and Australian acacias (Beck and Dunlop 2001; Trueman 2006). On the other hand, planted trees can take a multitude of forms besides timber plantations, including plantations for biodiversity conservation, watershed protection, shelterbelts and other environmental plantings in addition to urban forestry and increased plantings on farmland for various agroforestry and landscape purposes. These latter categories typically include a wide variety of species for which seed is the common propagation method, but few of these species are established in seed orchards and most seed is collected from natural populations or farmlands. With the rapid decline in natural forests, especially in the tropics, potentially good sources of seed are becoming scarce, and seed collectors must often rely on scattered trees in farmlands or fragmented forest remnants, which are often degraded. These are the challenges of modern seed supply. While the overall principles for collecting woody perennials, as written in the 1995 version of this chapter, are still valid, improved access to technical facilities and information have modified many practices. Technically, seed collection has become easier, thanks primarily to technical developments outside the forest sector. For example, the necessity for cleaning windows on tall buildings, pruning tall garden trees, etc., has made a multitude of extendable, telescopic and easy-to-assemble long-handled devices available in almost any hardware shop or building supplier around the world— tools that are indispensable for most seed collection from trees. Another example is the countless hours that have been spent on seed collection expeditions to potential seed sources, only to discover that seeds were not available either because of poor fruit set or bad timing. Modern communication to the remotest areas of most countries helps us avoid this problem, and GPS technology, satellite maps and computer databases have revolutionized the documentation process. Eventually, DNA technology, although still not available as a cheap pocket kit, will become indispensible for identifying genetic diversity and population structure, which are the very basics of genetic collection. Desiccation-sensitive (recalcitrant) seeds still pose a problem in connection with both collection and storage; however, a great deal of systematic work on a wide range of species has showed ways to overcome the practical problems of short-term storage, which, in turn, enables us to get seed from collection to planting site with minimal loss. Genetic quality is an important concern in almost all collecting of woody perennial seed. Traditionally, genetic quality refers to two things: ecotype (provenance) and the genetically dependent performance of the offspring of timber trees (for example, growth, straightness, wood quality, etc.). However, genetics influences all aspects of seed life, hence, also such characteristics as storability and health, which have traditionally been considered physiological aspects of seed quality. Diversity is therefore relevant to the collection of genetic resources as well as the breeding context, and genetic tests and trials, where available, may allow selection for genetic quality of desirable characteristics. Individual trees may perform well under a range of ecological conditions. However, although there are many examples of species that perform well outside their natural range (and even under quite different conditions from their parents), it is still considered “safe” to match planting sites with seed sources from similar environments. Computer-based tools have made site-source matching much easier because a number of potentially limiting factors can be combined. Pioneering work was done in Australia on speciessite matching using climatic data (Booth et al. 1989). Later models have been extended to other countries, including other ecological data (e.g., soil), and used for provenance recommendations (Booth 1996, 1998). Vegetation types, where described, are often a good indication of long-term suitability because they reflect long-term ecological interactions. For example, limiting factors for species growth may be recurrent intervals of disasters or stress factors such as typhoons, flooding, extreme drought, frost, hail storms or fires, which could be indicated by the types of vegetation growing in an area. Such risk factors are relevant for long-lived species like trees (VECEA 2012). Seed sources refer to identified populations from which seed is collected; seed trees refer to the individual mother trees (Palmberg 1985). Seed sources have traditionally been classified according to their perceived genetic quality (secondary to the origin) or to establishment and management methods (Barner et al. 1988; OECD 1974). Natural forests are the base populations for seed supply, representing long-term adaptation to local conditions and high diversity. Sources of improved genetic material are various types of seed orchards, consisting of selected genetic material and managed for seed production. Plantations and seed production areas are considered improved sources, as compared to natural stands, because selection of individual seed trees is possible based on phenotype characters for highly heritable characteristics. While categories of seed sources have been widely adopted in practical tree breeding and seed supply (Lantz 2008; Mulawarman et al. 2003), this classification system was developed for and is particularly suitable to traditional plantation species. It has limitations in connection with other planting types, especially agroforestry trees, which are often scattered. When used as seed sources, agroforestry trees or small populations of naturally occurring or planted trees are bulked during seed collection. Such “farmland seed sources” form a special category of increasing importance (Lillesø et al. 2011; Mbora et al. 2009). Most forest trees are facultative out-breeding, but inbreeding (including selfing) often occurs and produces poor-quality seeds (Boshier 2000). This is no different from most other organisms, but it is a particular concern in forest trees because many wild seed sources consist of widely spaced, scattered trees where individual trees are functionally isolated from cross-pollination with other trees. For example, commercially valuable species such as Dalbergia, Afzelia, Pterocarpus, Xylia and hardwood dipterocarps in Indochina have been and still are subject to selective logging, implying that the distance between mature flowering individuals after logging is often several hundred meters and the probability of cross-pollination may be seriously reduced. Where natural forests remain relatively well protected, seed collectors might have problems obtaining permits for collecting. Another risk of inbreeding has appeared in connection with the establishment of clonal plantations (e.g., from rooted cuttings or tissue culture). Individual members of clonal plantations are genetically identical, and crossing between ramets results in the same level of inbreeding as self-pollination. Clonally propagated casuarinas, eucalypts and acacias (including their species hybrids) are not only used in commercial plantations but are often indiscriminately distributed to farmers. Assessing the right maturation time: Some species undergo little visible change during maturation. Examples of maturation criteria are summarized in Schmidt (2000). Desiccation-tolerant species can often be after-ripened within the fruit after collection, since the major late maturation event is maturation drying (Berjak and Pammenter 1996, 2002). Desiccation-intolerant (recalcitrant) species pose a larger problem because they tend to undergo crucial development up to the time of dispersal. Only limited afterripening is possible, and collecting too early often results in poor germination (Berjak and Pammenter 1996, 2002). Rapid dispersal of mature seed: Wind-dispersed seeds are often released very fast during dry windy conditions. Fruit-eating organisms tend to feed on fleshy fruits before they can easily be harvested by shaking, sometimes leaving little for the seed collector, particularly in relatively poor seed years. Rapid germination of dispersed or shed seed: Seeds that do not undergo maturation drying (recalcitrant seeds) often germinate immediately after natural shedding under humid conditions; however, under wet conditions, even normally hard legume seeds can fail to develop their hard seed coat and germinate immediately (Schmidt 2000). Pest attack: Seed beetles (such as bruchids in acacias) often attack seed immediately before maturity, when the seed coat is still relatively soft. Attacks can also occur after natural seed fall. 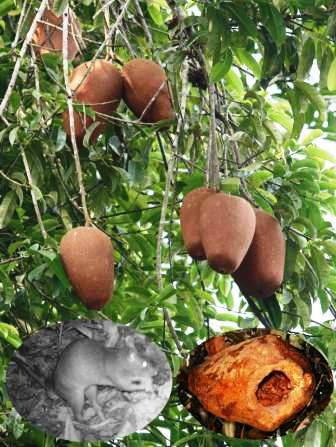 For example, while the seeds of Allanblackia stuhlmannii in East Africa remain enclosed in the large fruits until natural fall, they are readily removed by rodents, sometimes the same night they fall. For some species, collection time can be critical, since the time from maturation to dispersal, infestation or germination can be very short. Orthodox or desiccation-tolerant species are generally the easy ones, especially in dry fruits, since they often persist on trees for some time after maturation. Desiccationsensitive species, however, are problematic because maturation and germination are more or less continuous processes, allowing little time for seed collectors (Berjak and Pammenter 2002, 2003). The best general method for these species is to wait for natural fruit fall and proceed with pre-processing for temporary storage (see below). Most humid tropical species exhibit some degrees of periodicity with masting and interim unproductive periods that can vary from one to several years. At the other extreme are species with almost always some seed but little at any given time. These seeds are typically in inconspicuous greenish fruits and are dispersed by specialized dispersal agents. Cost of alternative collection methods: Cost effectiveness involves using the cheapest and easiest method so long as it does not interfere with seed quality and human safety. Hence, if sound, good-quality seed can be collected from the ground under trees, and possible contaminants can be dealt with during seed processing, there is no need to attempt more difficult methods. If seed-bearing branches can be reached and pruned by long-handled tools, climbing might be unnecessary, etc. Note, however, that the efficiency of pollination can be different in different parts of the tree: a different part of the crown might have had different pollination exposure and therefore represent paternity diversity, whereas lower branches might contain a higher proportion of inbred seed (Patterson et al. 2001). Seed accessibility: If seeds are physically out of reach (i.e., not on the ground and not reachable from the ground), tools and equipment must be used to collect them. Availability of equipment and training: Each collection method needs special equipment: shooting requires a gun and ammunition, climbing needs climbing spurs, etc. In climbing, shooting or the use of mechanical equipment (such as mobile platforms) there is also an implicit demand for skills and training. Some general conditions can be listed that hold for any type of accessories: they must be safe for the user, lightweight, easy to clean, preferably collapsible or foldable, strong and durable, simple to operate and versatile (easy to adapt to other functions or species). It is not usually possible to drive a vehicle right to the seed tree, so equipment often needs to be carried. Specially designed bags that can be carried as backpacks or small all-terrain carts can take the place of several members of field staff and tough field work. Further seed processing: The ease of extraction and cleaning can influence decisions on collection methods. Collecting seeds directly from the ground by raking or vacuuming will include a lot of debris, soil-borne pathogens and possibly other seed. This is not necessarily a problem as long as the seed can be cleaned and sorted afterwards and there is no debris that might harm the seed. Physiological quality: Seed that is collected early might be immature; seed collected late can be infested by pests or pathogens; seed collected from the ground can deteriorate or germinate quickly, depending on the seed type and the environment on the forest floor. Regulations, possible damage to trees and future crops: Protected areas often have strict regulations about damage to trees, which, in practice, might exclude most methods involving climbing. Collection using firearms can usually be done only by licensed staff. Safety: Some trees cannot be climbed without risk: tall, large-diameter trees that fork into a few large horizontal branches at great height; trees in urban areas, which are frequently entangled in electric wires; trees that might be weakened by stem infections or inhabited by wasps, bees or other pesky creatures. The somewhat disappointing recommendation in all these examples is to stay down and away. Three principal methods of seed collection are discussed below. Ground collection is generally the simplest way to collect seed, and sometimes the only suitable method. However, it has some unavoidable limitations: (a) the exact identity of the mother tree cannot always be ascertained, especially in high-density stands, (b) seeds may be lost among the debris on the forest floor and (c) seeds might be infested by ground predators or pests, or they might germinate immediately after falling. Identifying maternity is usually only an issue in connection with individual tree breeding because population collections are bulked anyway. Loss, predation, infestation or fast germination can sometimes be prevented or reduced by placing ground cover, such as nets, tarpaulins or other devices that retain seeds below the trees (Karrfalt 2008)—provided that the seeds are not very small or light, or that wind is not a factor. Ground collection with or without a ground cover inevitably involves pollution with debris like leaves, flower parts or soil, although most of the problems with pollution of seed lots has been overcome by the development of advanced seed-cleaning equipment and methods (Karrfalt 2008). The option of seed cleaning may even justify the use of rather “polluting” methods like vacuum collection or raking forest floors. The larger the seed, the easier it is to clean them. At least here many recalcitrant species have an advantage. Modern tree climbing harnesses and ascending equipment are designed to be safe as well as convenient ‘working platforms’ during collection and other canopy work. Long-handled tools may be used from the ground or any elevated structure like a car roof, ladder, or hydraulic lift, or during climbing. Most sectional and telescopic poles have a maximum length of about 3.5 to 4.5 meters, which is about the maximum for practical operation. Extended poles designed for tree work often have exchangeable tool heads, such as pruners, hooks and saws. There are even telescopic chain saws. Window cleaning has made a variety of telescopic poles available, which can be used for tree work. Most savannah-type trees and relatively exposed agroforestry trees with branches bearing low-hanging fruit can be reached with long-handled tools. Climbing is often inevitable in cases where the identity of the mother tree must be certain, where loss of seeds to predators or dispersal exclude collection from the ground, where fruits have not started to fall when the seed collection takes place, or where other factors exclude easier collection methods. Climbing always implies a safety risk. Some trees cannot and should not be climbed under any circumstances, and many more should only be climbed by trained staff using advanced tree-climbing equipment. In general, the more secure the climber is, the more easily s/he can use hands and pay attention to fruit harvesting, and the more efficient s/he will be. Ladders may be used up to a height of 5 to 10 meters. Again, thanks to the building industry, lightweight aluminium extension ladders are readily available in most parts of the world. Telescopic ladders with a maximum length of about 4 meters are becoming increasingly popular and thus available; they are both lightweight and easy to transport. Taller trees are usually climbed with the help of climbing spurs (for details, see Blair 1995; Schmidt 2000, 2007; Stubsgaard 1997; Yeatman and Nieman 1978). Climbing spurs have remained relatively unchanged for decades. Modern safety belts (harnesses) have, probably thanks to various tree-climbing associations, become lightweight and much more comfortable than the old ones were (Anon. 1995; Blair, 1995). Comfort is especially important since belts serve not only as safety devices but also as working platforms during collection. Most work in the canopy is done with a safety rope placed over a stout branch at a high point in the tree. Instead of the three-stranded ropes that were formerly used, most climbers now use braided ropes, which are both softer and lighter. The rope locks on ascenders make movement in the canopy easy and safe. As an alternative to ascending via the bole (with spurs or ladders), the safety line may be placed directly over high branches by advanced line technique. Throw-lines and various ballistic devices may be used (see, for example, Gunn 2001; Schmidt 2000, 2007). Probably the most efficient is the so-called “big-shot”, which is a powerful catapult for line throwing. It is placed on the ground when in use and can shoot a small sandbag of about 150 grams about 25 meters up. Advanced lines can also be used to place flexible pruning saws over individual branches that can be cut by alternately pulling the two lines of the saw. 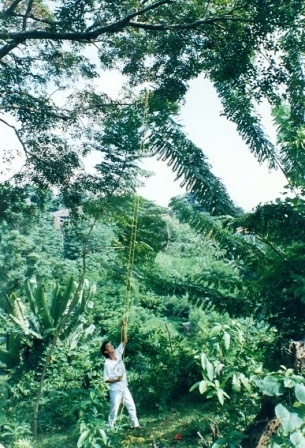 Shooting down high fruit-bearing branches is another technique to bringing down fruits without climbing (Gunn 2001). However, this technique has never really caught on outside of Australia, which may partly be because it is technically most suitable to very tall, small-seeded trees like eucalypts. Potential deterioration: After collection, seed (a) might deteriorate physiologically due to adverse conditions such as high heat or excessive moisture, (b) might be attacked by pests or pathogens (pests covering anything from rats to insects, pathogens normally referring to bacteria and fungi that cause rot), or (c) might germinate. Germination only takes place at high moisture content and can, for desiccation-tolerant species, be prevented by drying. Pests and pathogens differ in their habit of attack. Sometimes they attack only soft moist material; sometimes the seed itself. Physiological deterioration means damage or death of essential seed cells or their components. Conditions of seed or fruits at the time of collection: Moisture, high temperature and debris tend to aggravate decomposition. Duration of temporary storage: Most types of deterioration work over time; hence, the longer the time from collection to processing, the higher the risk. Desiccation rate is often important: dry the seed as quickly as possible to the lowest safe moisture content (LSMC), which is variable between species and within species. Keep the seeds under cool temperatures. Sow the seeds as soon as possible. Seed extraction refers to the technique of physically removing seeds from their fruit or equivalent morphological covering. Extraction has several purposes: eliminating redundant bulk, separating individual seeds, removing easily decomposable fruit structures, eliminating fruit inhibitors or other dormancy structures, and removing potential sites for pest and disease attack. In some cases, extraction is necessary. In other cases, seed collectors may choose not to extract or only partly extract the seeds. Seeds of very thin-coated species (e.g., Cupressus, Pterocarpus) can easily be damaged during extraction, and it is often better to store them with their fruit covering intact. Seeds of dehiscent dry fruits and cones are simply extracted by drying the fruits or cones and letting seeds fall out themselves, or sometimes with a bit of shaking or tumbling. Seed extraction from most dry dehiscent fruits and cones is very easy as long as the fruits and cones can be dried to a sufficiently low moisture content. Under adverse humid conditions and in the so-called serotinuous species (species with a large amount of resin or that open only under extreme conditions), special kiln or oven drying is necessary. Extraction procedures are described in ATCS (n.d.), Karrfalt (2008) and Schmidt (2000, 2007). Seeds of some species tend to remain attached to the dry fruit covering after drying. This includes some cones and indehiscent dry fruits, such as some animal-dispersed acacias. Some wind-dispersed legumes also remain firmly attached to the split pod by a strong funicle. Such fruits need mechanical disintegration or splitting up of the entire fruit structure to separate the seeds (e.g., by mechanical threshing). In nuts and samaras, seed and fruits are dispersed as an entity, which cannot in practice be separated or separated only with great danger of damaging the seed. Fleshy fruits like berries and drupes are usually extracted by wet extraction (e.g., washing and rubbing). Seeds of some species have fleshy attachments, typically an aril, while the seeds are enclosed in a dry fruit type, such as a follicle, pod or capsule. Magnolias and Australian acacias are examples of such species. Seeds must here be extracted in two rounds: first, a dry extraction in which fruits are dried to promote natural dehiscence and, second, a wet extraction where seeds are washed and rubbed to remove the fleshy aril. In the case of some acacias, the aril is relatively loosely attached to the seed and can be removed by dry tumbling with or without some abrasive material. Collection and processing methods must be adjusted to species and environments. An attempt to describe and recommend procurement procedures for individual species occurs in the series of Seed Leaflets published by Forest&Landscape, Denmark (FLD) (http://sl.life.ku.dk/English/outreach_publications/reports/seed_leaflets.aspx). For Latin American species, see Vozzo (2002) (www.rngr.net/publications/ttsm). For the Pacific Islands, see Elevitch (2006) (www.traditionaltree.org) and Gunn et al. (2004). The main challenge to the supply of tree seed is providing high-quality seeds of priority species to end users, such as nursery and plantation owners or smallholders. The problem often starts with identifying and getting access to good-quality seed sources. For a number of species in the tropics, the quality of natural seed sources has been declining and there is a shortage of planted seed sources, not to mention field tests to prove or document genetic quality. For the majority of planted species, genetic tests are virtually absent and recommendations on quality often rely merely on speculations about site-source matching and diversity. Another complication, particularly for agroforestry trees, is that they are rarely assessed on their performance in intercropping. Since on-farm trials of trees are very difficult to monitor, the genetic quality of intercropped trees needs far more documentation. A prerequisite for testing and documentation is that seed sources must be well defined and described. Few tropical countries have accessible, updated databases on seed sources, and there is encroachment on seed sources with the result that many seed sources now only exist on paper. Modern GPS and database technology, satellite maps and ease of communication should make such databases easy to document. There is a huge challenge to collect and update information nationally and on a global scale. Tree size and the consequent area requirement make it virtually impossible to imagine a network of good seed sources, covering different ecotypes, for all species that will be planted in significant numbers. However, it would be feasible to include considerations for future seed sources in the criteria on conservation stands. The mechanics of seed collection are not complicated if the seeds are there (the exception being some extremely tall forest trees, where canopies cannot be reached without great risk) and collectors have access to the necessary equipment. However, the cost of collecting plays a key role in the supply of seeds and an inevitable consequence is that many otherwise useful and interesting species are de facto deselected because of the cost of collecting the seed and the resulting lack of availability. There should be incentives to further rationalize seed procurement with the use of more efficient equipment. However, a key constraint for a number of lesser known species is the shortage of good seed sources and unpredictable seed production. For desiccation-sensitive seeds, in particular, it is not easy in seed-distribution and plantation systems to cope with irregular and unpredictable supplies. A major challenge would be to systematically record reproduction over many years and in this way develop a better prediction model, so that nurseries could take advantage of sudden masting. A more modest interim measure would be to record flowering, which precedes fruiting. Although desiccation sensitivity is an innate species characteristic, the project initiated by the International Plant Genetic Resources Institute (IPGRI) and DANIDA Forest Seed Centre (DFSC) in 1995 carried out a systematic investigation of desiccation and storability behaviour—making a great leap forward in terms of adjusting processing and storage conditions to the need of individual species (Sacandé et al. 2004). The possibility of storing seed for a shorter period is a necessary buffer in seed procurement and supply. Or, from another angle, without the possibility of seed storage, the supply of a number species to a number of potential planters would be very difficult. Therefore, the aim should be to make optimal desiccation and storage protocols for as many species as possible (Thomsen 2000; Thomsen and Diklev 2000). Seed supply and distribution systems need to be more efficient, especially for reaching smallholders. It is somehow ironic that the food-supply system has been able to establish the distribution of products like fruits and fish, while setting up a supply chain of forest seed has been extremely difficult. Among the many hurdles are the challenges of minimizing the monopolies of public enterprises, making guarantees for quality (physiological and genetic) and supplying relatively small quantities of seed. The major challenges of future seed supplies are probably those connected to global and regional climate changes. Plant growers will have to adapt planting and, thus, selection of planting material according to predicted changes. This is likely to change the traditional 1:1 source-to-site matching. Instead, seed sources may be targeted in areas more prone to drought, flooding, wind or other adverse conditions to adjust for predicted changes in climate. Changes in temperature, rainfall and wind patterns will inevitably influence vegetation zones and species requirements. Natural vegetation tends to indicate a long-term adaptation to prevailing climate, soil and other ecological conditions. For East Africa, for example, old vegetation maps have been used to predict species and provenance matching of forest trees. Digitalized versions of such maps may be used as a tool to match source and planting sites even under changed ecological and climatic conditions (VECEA 2012). Anon. 1995. A Guide to Good Climbing Practice. The Arboricultural Association, Stonehouse,UK. Barner H, Olesen K, Wellendorf H. 1988. Classification and selection of seed sources. Lecture Note No. B-1. DANIDA Forest Seed Centre, Humlebaek, Denmark. Available online (accessed 21 June 2012): http://curis.ku.dk/portal-life/files/20656557/b1_001.pdf. Beck SL, Dunlop RW. 2001. Micropropagation of the Acacia Species—A Review. In Vitro Cellular & Developmental Biology—Plant 37(5):531–538. Berjak P, Pammenter NW. 1996. Recalcitrant (desiccation sensitive) seeds. In: Olesen K, editor. Innovations of Tropical Tree Seed Technology. Proceedings of the IUFRO Symposium of the Project Group P.2.04.00, “Seed problems”, Arusha, Tanzania, 7–10 September 1995. DANIDA Forest Seed Centre, Humlebaek, Denmark. pp 14-29. Available online (accessed 21 June 2012): www.iufro.org/download/file/3485/4376/20903-arusha1995-1_pdf. Berjak P, Pammenter NW. 2002. Orthodox and recalcitrant seed. In: Vozzo J, editor. Tropical Tree Seed Manual. Agriculture Handbook 721. USDA Forest Service, Washington DC. pp 137-147. Available online (accessed 21 June 2012): www.rngr.net/publications/ttsm/ch4. Berjak P, Pammenter NW. 2003. Understanding and handling desiccation-sensitive seeds. In: Smith RD, Dickie JB, Linington SH, Pritchard HW, Probert RJ, editors. Seed Conservation: Turning Science into Practice. Royal Botanic Gardens, Kew. pp.415–430. Available online (accessed 21 June 2012): www.kew.org/science-research-data/kew-in-depth/msbp/publications-data-resources/technical-resources/seed-conservation-science-practice/SCTSIP_chapter22.htm. Blair DB. 1995. Arborist Equipment: A Guide to the Tools and Equipment of Tree Maintenance and Removal. International Society of Arboriculture, Champaign, IL. Booth TH. 1996. Predicting plant growth: Where will it grow? How well will it grow? In: Proceedings of the Third International Conference/Workshop on Integrating GIS and Environmental Modeling, 21–25 January 1996, Santa Fe, New Mexico. National Center for Geographic Information and Analysis, Santa Barbara, CA. Available online (accessed 21 June 2012): www.ncgia.ucsb.edu/conf/SANTA_FE_CD-ROM/sf_papers/booth_trevor/booth.html. Booth TH. 1998. A broadscale land evaluation program to assess the potential for growing particular trees in Africa. Agroforestry Systems 40(2):125–138. Booth TH, Searle SD, Boland DJ. 1989. Bioclimatic analysis to assist provenance selection for trials. New Forest 3:225–234. Boshier DH. 2000. Mating systems. In: Young A, Boshier DH, Boyle TJ, editors. Forest Conservation Genetics: Principles and Practice. CABI Publishing, Wallingford, UK. pp.63–79. Elevitch CR, editor. 2006. Traditional Trees of Pacific Islands: Their Culture, Environment, and Use. Permanent Agriculture Resources. Holualoa, Hawaii. Individual chapters available online (accessed 26 June 2012): www.traditionaltree.org. Gold K, León-Lobos P, Way MW. 2004. Manual de recolección de semillas de plantas silvestres. Boletín INIA 110. Instituto de Investigaciones Agropecuarias, La Serena, Chile. Available online (accessed 26 June 2012): www.kew.org/ucm/groups/public/documents/document/kppcont_028061.pdf. Gunn B. 2001. Australian Tree Seed Centre Operations Manual. Australian Tree Seed Centre, Canberra. Available online (accessed 19 June 2012): www.csiro.au/Organisation-Structure/Divisions/Plant-Industry/~/media/CSIROau/Divisions/CSIRO%20Plant%20Industry/ATSCmanual_CPI_pdf%20Standard.pdf. Gunn B, Agiwa A, Bosimbi D, Brammall B, Jarua L, Uwamariya A. 2004. Seed Handling and Propagation of Papua New Guinea’s Tree Species. CSIRO Forestry and Forest Products, Canberra. Karrfalt RP. 2008. Seed harvesting and conditioning. In: USDA. The Woody Plant Seed Manual. Agriculture Handbook 727. United States Department of Agriculture, Forest Service, Washington DC. pp.57–83. Available online (accessed 26 June 2012): www.rngr.net/publications/wpsm/chapter3/at_download/file. Lantz CW. 2008. Genetic improvement of forest trees. In: USDA. The Woody Plant Seed Manual. Agriculture Handbook 727. United States Department of Agriculture, Forest Service, Washington DC. pp.39–56. Available online (accessed 26 June 2012): www.rngr.net/publications/wpsm/chapter2/at_download/file. Lillesø JBL, Graudal L, Moestrup S, Kjær ED, Kindt R, Mbora A, Dawson I, Muriuki J, Ræbild R, Jamnadass R. 2011. Innovation in input supply systems in smallholder agroforestry: Seed sources, supply chains and support systems. Agroforest Syst 83:347–359. Available online (accessed 26 June 2012): www.springerlink.com/content/v8v370k841282069/fulltext.pdf. Lyngdoh N, Joshi G, Ravikanth G, Shaanker RU, Vasudeva R. 2010. Influence of levels of genetic diversity on fruit quality in teak (Tectona grandis L.f.). Current Science 99(5):639–643. Available online (accessed 26 June 2012): http://repository.ias.ac.in/55511/1/21_pub.pdf. Mbora A, Barnekov Lillesø JP, Schmidt L, Angaine P, Meso M, Omondi W, Ahenda J, Mutua NA, Orwa C, Jamnadass R. 2009. Tree Seed Source Re-classification Manual. World Agroforestry Centre, Nairobi. Available online (accessed 26 June 2012): www.worldagroforestry.org/sites/default/files/Tree_Seed_source_classification_manual.pdf. Mulawarman, Roshetko JM, Sasongko SM, Irianto D. 2003. Tree Seed Management—Seed Sources, Seed Collection and Seed Handling: A Field Manual for Field Workers and Farmers. TFRI Extension Series No. 152. International Centre for Research in Agroforestry and Winrock International, Bogor, Indonesia. Available online (accessed 19 June 2012): www.worldagroforestrycentre.org/SEA/Publications/Files/manual/MN0007-04.pdf. OECD. 1974. Scheme for the Control of Forest Reproductive Material Moving in International Trade. Organisation for Economic Cooperation and Development, Paris. Palmberg C. 1985. Sampling in seed collection. In: FAO. Forest Tree Improvement Forestry Paper 20. Food and Agriculture Organization of the United Nations, Rome. pp.41–45. Available online (accessed 26 June 2012): www.archive.org/stream/foresttreeimprov034656mbp/foresttreeimprov034656mbp_djvu.txt. Patterson B, Vaillancourt RE, Potts BM. 2001. Eucalypt seed collectors: beware of sampling seedlots from low in the canopy. Australian Forester 64:139–142. Sacandé M, Jøker D, Dulloo ME, Thomsen KA, editors. 2004. Comparative Storage Biology of Tropical Tree Seeds. Available online (accessed 26 June 2012): www2.bioversityinternational.org/publications/1032/. Schmidt L. 2000. Guide to Handling of Tropical and Subtropical Forest Seed. DANIDA Forest Seed Centre, Humlebaek, Denmark. Individual chapters available online (accessed 26 June 2012): http://curis.ku.dk/portal-life/da/publications/guide-to-handling-of-tropical-and-subtropical-forest-seed(04448600-8813-11df-928f-000ea68e967b).html. Schmidt L. 2007. Tropical Forest Seed. Springer Verlag, Berlin. Stacy EA. 2001. Cross-fertility in two tropical tree species: Evidence of inbreeding depression within population and genetic divergence among populations. American Journal of Botany 88(6):1041–1051. Stubsgaard F. 1997. Tree Climbing for Seed Collection, Techniques and Equipment. Technical Note No. 44. DANIDA Forest Seed Centre, Humlebaek, Denmark. Available online (accessed 26 June 2012): http://curis.ku.dk/portal-life/files/33049474/TN44.pdf. Thomsen K. 2000. Handling of Desiccation and Temperature Sensitve Tree Seeds. Technical Note No. 56. ANIDA Forest Seed Centre, Humlebaek, Denmark. Available online (accessed 26 June 2012): http://curis.ku.dk/portal-life/files/20711281/technical_note_56.pdf. Thomsen K, Diklev S. 2000, Laboratory Manual for Basic Tree Seed Studies. Technical Note No. 57. DANIDA Forest Seed Centre, Humlebaek, Denmark. Available online (accessed 26 June 2012): http://curis.ku.dk/portal-life/files/20711330/technical_note_57.pdf. Trueman SJ. 2006. Clonal propagation and storage of subtropical pines in Queensland, Australia. The Southern African Forestry Journal 208(1):49–52. USDA. 2008. The Woody Plant Seed Manual. Agriculture Handbook 727. United States Department of Agriculture, Forest Service, Washington DC. Available online (accessed 26 June 2012): http://www.rngr.net/publications/wpsm. VECEA. 2012. Potential Natural Vegetation of Eastern Africa. Vegetation and climate change in Eastern Africa. Forest&Landscape, Denmark, Frederiksberg, Denmark. Seven-volume series available online (accessed 26 June 2012):. http://sl.life.ku.dk/English/outreach_publications/computerbased_tools/vegetation_climate_change_eastern_africa/series.aspx. Vozzo JA, editor. 2002.Tropical Tree Seed Manual. USDA Agriculture Handbook 721. United States Department of Agriculture, Forest Service, Washington DC. Available online (accessed 26 June 2012): www.rngr.net/publications/ttsm. Yeatman CW, Nieman TC. 1978. Safe Tree Climbing in Forest Management. Forestry Technical Report 24. Canadian Forestry Service, Ottawa. Re-issued as Safe Tree Climbing in Forest Management. Technical Note No. 24. DANIDA Forest Seed Centre, Humlebaek, Denmark. Bonner FE, Vozzo JA, Elam WW, Land JSB. 1994. Tree Seed Technology Training Course. Instructor’s Manual. United States Department of Agriculture, Forest Service. Southern Forest Experiment Station. www.uri.edu/cels/ceoc/documents/TreeSeedTechnologyTrainingCourse-InstructorsManual.pdf. DFSC/FLD. [Series of lecture notes, technical notes, research reports and the like pertaining to tree seed, seed sources and genetic improvement and conservation.] DANIDA Forest Seed Centre (now Forest&Landscape, Denmark), Humlebaek, Denmark. http://sl.life.ku.dk/English/outreach_publications/reports/publications_from_former_dfsc.aspx. FLD. 2000+. Seed Leaflets. [Open-ended series of concise technical notes for individual species. By January 2012, the series contained about 155 publications on plantation, fruit and agroforestry species.] DANIDA Forest Seed Centre and Forest&Landscape, Denmark, Humlebaek, Denmark. http://sl.life.ku.dk/English/outreach_publications/reports/seed_leaflets.aspx. Florabank guidelines for best practice for seed collection and use: www.florabank.org.au/default.asp?V_DOC_ID=755. ICRAF/World Agroforestry Centre. Tree Seeds for Farmers: A Toolkit and Reference Source. www.worldagroforestry.org/sites/default/files/Toolkit.pdf. ICRAF/World Agroforestry Centre. Agroforestree Database: www.icraf.org/resources/databases/agroforestree. IUFRO. 1995. Innovations in Tropical Tree Seed Technology. Proceedings of the IUFRO Symposium of the Project Group P.2.04.00 “Seed Problems”, Arusha, Tanzania, 7–10 September 1995. www.iufro.org/download/file/3485/4376/20903-arusha1995-1_pdf. Longman KA. 2003. Raising Seedlings of Tropical Trees. Tropical Trees: Propagation and Planting Manuals, Volume 2. Food and Agriculture Organization of the United Nations, Rome. www.fao.org/DOCREP/006/AD230E/AD230E00.HTM. Smith RD, Dickie JB, Linington SH, Pritchard HW, Probert RJ, editors. 2003, Seed Conservation: Turning Science into Practice. Royal Botanic Gardens, Kew, UK. www.kew.org/science-research-data/kew-in-depth/msbp/publications-data-resources/technical-resources/seed-conservation-science-practice/index.htm. Tree Planters Notes. 1950+. [Series of practical applied research reports pertaining to forest seed, nursery practice, plantation establishment and other tree plantings.] United States Department of Agriculture, Forest Service. Individual volumes available: www.rngr.net/publications/tpn. USDA. 2008. The Woody Plant Seed Manual. Agriculture Handbook 727. United States Department of Agriculture, Forest Service, Washington DC. Individual chapters and entire manual available: www.rngr.net/publications/wpsm. Willan RL. 1983. A Guide to Forest Seed Handling, with Special Reference to the Tropics. Food and Agriculture Organization of the United Nations, Rome. www.fao.org/DOCREP/006/AD232E/AD232E00.HTM. Organizations with documents of relevance to seed collection on the internet.